The word 'Meissen' suggests a highly appreciated kind of hard - paste porcelain because the first European hard - paste porcelain factory was founded in Meissen, a little town on the Elbe river near Dresden (Germany). Meissen, a beautiful town with its captivating surroundings produced the Europe's oldest Porcelain manufactory. Near Dresden where the Triebish flows into the Elbe river, lies the charming, more than one thousand-year-old city of Meissen. Each of the inhabitants loves the city and the characteristic Elbe valley with its syenite rocks and sunlit vineyards on the slopes. They pride themselves on the numerous monuments which reflect a changing history, adhere to the Meissnian-Saxonian coziness of the wine pubs, and swear by the dry Meissen wine. Their pride is mixed with sadness, however, because the buildings of the city are threatened with fast dilapidation. The porcelain manufactory was established on June 6, 1710 in the late Gothic fortress of "Meissewhich in 1676 had been renamed "Albrechtsburg" after Duke of Albert of Saxony. This place outside the capital Dresden was selected because the huge Albrechtburg was not inhabited then, and the area of mountains could easily be guarded to protect the secret of Porcelain manufacture and the wood needed for the ceramic kilns could easily be transported there on the river Elbe. When the first Porcelain manufactory of Europe (Meissen Porzellan - Manufaktur) was founded in 1710, it was fairly unthinkable to pen it to the public: on the contrary, the factory was the object of strictest secrecy. Today the Meissen Manufactory allows every enthusiast of porcelain to look how porcelain is made and to be informed of the house's history. There are but a few production secrets that are still inviolable. The china museum of the manufactory including a demonstration workshop with four work places (established in 1960) has on average 300,000 visitors from Germany and abroad in each season. The museum and the workshop are open to visitors and explanation workshop are available on tape in twenty five languages. Between 1912 and 1915 the directors of the Meissen porcelain manufactory had a representative building erected right on the manufactory's territory to host part of the model collection, making it available to the public. At the topping-out ceremony of this building, the then director Julius Heintze declared that the model hall "was to fulfil some purposes in addition to the traditional tasks of a museum. It shall make selection easier to the customer, provide the connoisseur with an overview of the best and most beautiful pieces of the manufactory and it shall provide an opportunity for artists to study antique and modern patterns." The architects created a building with an interior which includes both large party halls and more intimate rooms so that the exhibited model porcelains can be presented in accordance with their character. These interior structures have been preserved up to the modern day giving the china museum its own unmistakable character. Today, the museum draws its exposition that changes almost every year on the vast amount of models stored in the depot of the manufactory. The 5000 pieces of porcelain exhibited in the museum are to illustrate important lines of development of Meissen porcelain from 1710 to the present. Meissen porcelain has been sold in all periods of the manufactory's existence and important collections of Meissen have been set up in many other cities and countries. However, these are all different from the Meissen museum because they offer only selective insight into the history of Meissen porcelain. The particular value of the Meissen china museum is that it is only here that the visitor is given a relatively complete survey of the history of Meissen porcelain from the eighteenth century to this day. The exposition of the china museum begins with exhibits made from fine red stone ware from the early period of the "Porzellan manufactory" and ends with contemporary studio porcelains of the present day. Between these cornerstones, the items exhibited in the museum represent nearly three centuries of porcelain design in Meissen, all times in bloom and decline, all styles and influences of art. On the whole, the visitor is stunned by the abundance of subjects and artistic expression. From today's viewpoint, these collections are extremely valuable and even a prerequisite for the permanent work of the manufactory it self. In each season, the permanent exposition of the museum is supplemented by a special exposition which is usually dedicated to a certain topic and its development through three centuries such as hunting scenes, the change of style in table culture or the topic of time illustrated by clock casings that are made from Meissen porcelain. On the other hand, each year pieces of porcelain from the Meissen museum are lent to expositions both in Germany and abroad, in countries such as Japan, Italy, USSR or Austria. The model collection is constantly being extended mainly by purchases from private collectors or takeovers from the modelling departments of Meissen. The chief advantage of the manufactory having a model collection of its own is quick access to the models by all design departments while the main advantage is of course the hazard during their transport within the building. At the beginning of the Meissen manufactory porcelain design was much oriented by the East Asian example (Indian paintings, dragon patterns, onion patterns etc). 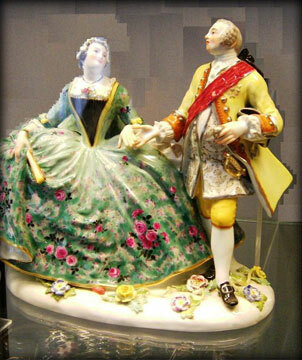 In the twentieth century, various artists worked for Meissen as freelances for sometime. Among the pieces of porcelain, Hunting scens, "Sulkowski", "Swan service", flower bouquet paintings", "New cut-out" are prominent creations.